In the Sword Art Online anime, we see Kirito enter Alfheim Online first in episode 16. Although he is supposed to enter the Spriggan base when he first arrives, he instead encounters something like a glitch and ends up in a forest. Is there any explanation in the anime or light novels for why this happened? I don't recall it being mentioned in any of the later anime episodes. Note: from a plot point of view it's somewhat necessary that this happens since it gives him a way to meet Leafa, but this still doesn't really explain why this happens purely within the context of the SAO continuity. In case it isn't clear from my wording and the inclusion of the first image, I am asking why Kirito ends up in the forest after some sort of glitch appears while he is travelling to the Spriggan base (where he was supposed to go initially). The accepted answer here gives the best explanation for why that's the case. "[...]. Yggdrasil...she seems to be there. That place, you know it?" "Ah, this I know. Eh, eh, it's generally to the northeast, but quite a ways from here. If I were to convert it into real distance, it would be about fifty kilometers away." "Wow, that really is a long distance. That’s what, five times the diameter of Aincrad. Actually, why was I brought to this forest anyway?" Yui lowered her head for a moment at my question. "I think that your positional data was either damaged or confused with a nearby player, resulting in you ending up here. That’s just a guess, though." In the screenshot, the pyramid like structure is the signature building of the Spriggan hometown. 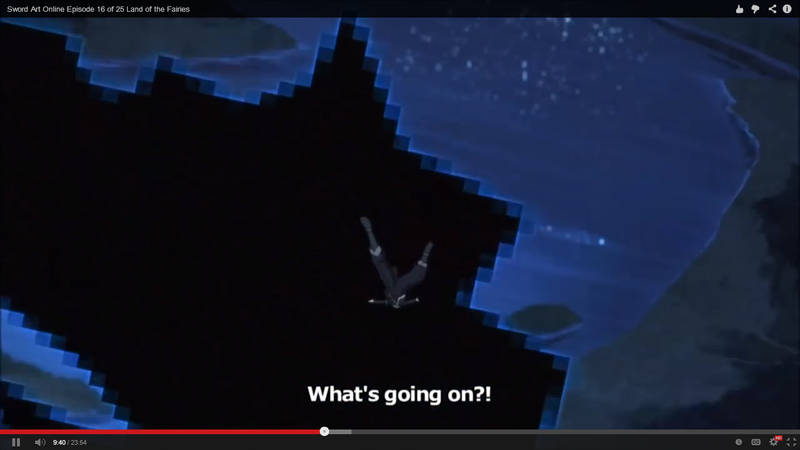 The blocky void above it is the glitch that "teleports" Kirito to the forest. Since Kirito and Asuna was teleported to the sky outside Aincrad in SAO moments before the game shut down, and Kirito's character data from SAO was loaded in ALO, chances are that the positional data was also loaded, which sent him on a free fall nosediving trip into the forest 50 kilometers away from Yggdrasil. While this matches the fact that ALO's map is much bigger than SAO (as seen in the above quote), it was quite a miracle that Kirito dropped right at the forest where Leafa was. As the map in ALO is much bigger, he might as well had ended up elsewhere in ALO. Since Kirito and Suguha were accessing the game from the same IP address (which is quite common for IPv4 in real world), Kirito's positional data got glitched up and he was dropped in the forest where Suguha (Leafa) was, instead of the hometown of the Spriggan. The fact that he fell from the sky matches the fact that Leafa was having a mid-air fight. I admit this is a bit stretching, but this is the closest I could relate a real life concept with the theory above to explain the proximity of Kirito and Leafa's position in the game and the timing when the glitch happened. (Either way, I take it as an excuse for the story instead of general knowledge). What I think happened is that since ALO is made off of SAO, and the place you log off in ALO is the place you stay unless in a safe spot or a hut, and the SAO game ended with him in the boss room that maybe the place he got moved to is the same spot he was last in at SAO. Speculation: Yui's item was in Asuna's sotrage, in that she was wearing it on her person in the final fight with 'Heathcliff'. We know that the storage between married characters is shared, so when her avatar dies in SAO Kirito would gain all her storage and inventory items (also a possible reason why he uses her sword to fight with when his second breaks, it was in his inventory). 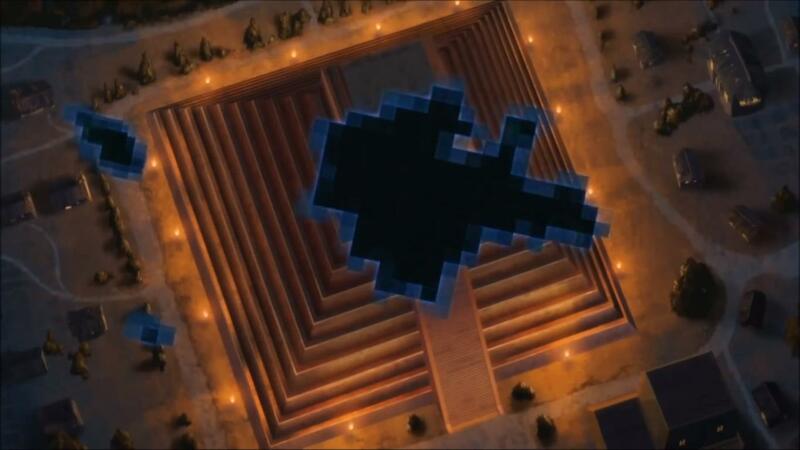 Since we know that neither Kirito or Asuna die (IRL) and ALO's data was a merger of SAO's client I think it would be possible that the data link between them was having an effect on Kirito's inital spawn location, in that he was being spawned in her area, the Tree of Life. However, due to the admin rights and lock downs by RECT the system overrode this link and force spawned him out of the Tree of Life. Since the IP was linked with two VR devices (Leafa and Kirito) his new spawn area was generated from her world position. The worlds work basically the same. So where he was in that SOA technically his location mapped over to that worlds map location. that is why he dropped out of the sky that way and retained all his data. His local x,y position was where he started. He has special data since he has Yui's data written into his local. So that data overwrote the starting default for users. There was never an explanation in the novel, as far as I could remember. However, everything about SAO indicates that player data is saved locally (like how Kirito said he saved Yui to his NerveGear's storage, which somehow put her in his inventory when he got into ALO). Additionally, the fact that ALO used SAO's source would explain why ALO might become confused, and load in Kirito's previous data from SAO. To some extent, this makes sense in the context of SAO. Saving the data on a remote database would possibly allow "others" to tamper with it, and possibly alter player stats, one way or another. My guess is, this means ALO's player data is also saved client-side. You could reason that this is because ALO's programmers were stupid (Look at how ALO makes use of "GM Pass cards" and 12 digit (wut?) number pads, for things that are supposedly very important). However, I doubt Kawahara really thought that far ahead. How does Kirito come back to life when he's fighting Heathcliff? Where does Kirito get his new gear?